“Who, What, When, Where, Why, JESUS? !” from Christian Faith Publishing author Brooke Davis is a useful book that helps children understand and retain the concepts about who Jesus is, providing suggested Bible readings that parents can read with them. “Who, What, When, Where, Why, JESUS? !”: an enlightening book that provides Bible-based teachings and suggested Bible readings about who God is, effectively covering the foundations of Christianity. “Who, What, When, Where, Why, JESUS? !” is the creation of published author, Brooke Davis, a passionate mother of six children. 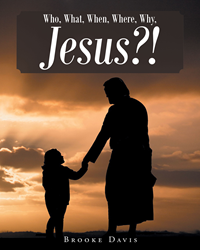 Published by Christian Faith Publishing, Brooke Davis’s new book serves as a guide for children to understand the foundations of Christianity by knowing everything about Jesus Christ, especially what he had to do just to save mankind from sin and why believing and placing their faith in him is necessary. This is an informative book that can also be used to encourage children to give importance in holding on to biblical truths, with the hopes that someday, when they grow up, they will also pass these down to their own children. View a synopsis of “Who, What, When, Where, Why, JESUS? !” on YouTube. Consumers can purchase “Who, What, When, Where, Why, JESUS? !” at traditional brick & mortar bookstores, or online at Amazon.com, Apple iTunes store, Kobo or Barnes and Noble. For additional information or inquiries about “Who, What, When, Where, Why, JESUS? !”, contact the Christian Faith Publishing media department at 866-554-0919.